In order to start, we should take a moment to discuss how it is that a new game is generated. 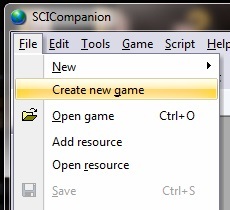 If you look in the Sci Companion Directory, you will notice a folder named "Template". This is the folder that will be copied and used as the source for your new game. If you haven't already done so, you may want to swing by the tools page and grab a fresh copy of the template game as it has been updated since the initial release with several bug fixes. Also, you have the option to create a Parser based game as well as a Point and Click style adventure game. Simply replace the original template folder with the template style of your choice and rename it "Template". Now that your updated template file is in place, we are ready to begin. Select "file" and "Create New Game"
A window will open allowing you to give your game a name as well as choose the location that it will be created. One thing to note, you will definitely want to add "\folderName" to the end of the location selected if you have not already created a folder to hold your game resources. Otherwise all of the game files will be copied to the exact source listed and you may end up with a number of files somewhere where you don't really want them. The game files will be copied and the game will load up to the first room script. This is a good opportunity to test out your operating system's setup. As these games where originally developed on DOS systems, as computers progress we find ourselves farther and farther away from being able to play these games natively. To find out if you are good to go as is, simply click on the Run Game icon . If the game opens, you are good to go and can go ahead and skip now to Programming the first Room. If however, you get an error then please keep reading. If you are using an updated template from the tools page, then browse to your game folder and find the file "DOSBoxRunSetup.exe". This program creates a few edits and updates which points the run game button you clicked earlier to actually start the game in a DOS emulator named DoxBox. This program will need to be installed on your computer and if you don't already have it, can be found either on the tools page or from the dosbox website. Once DosBox is installed, double click on "DOSBoxRunSetup.exe". 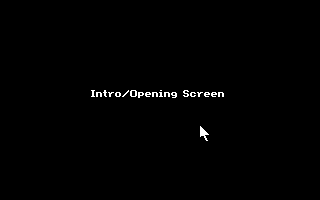 A series of screens will allow you to set up the game to run automatically under dosbox. You can probably get by with all of the default settings and just click next all the way through. captures= .Which then places any dosbox screen captures that you make into the actual game folder rather than the dosbox default screen capture folder. Neither of these edits are necessary, but you may find them useful. Now, assuming you have made it this far, click on the run game icon again and see if things don't work out a little better for you this time. You should see the default title screen and upon pressing any key, you will see the ego in an empty room. Now we are ready to begin work on our first room.